Almsman means a person who is living through charitable offerings.It was sited in Shakespeare’s King Richard II (R2 III.iii.149 [King Richard says to Aumerle] I’ll give my gay apparel for an almsman’s gown. 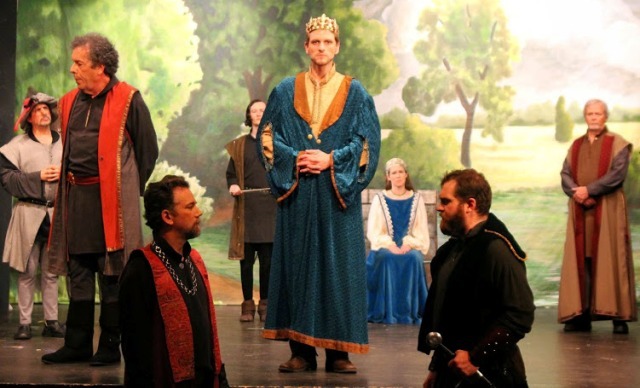 From Left, Bagot (Allan Kleban), John O’Gaunt (Dan Tucker), Bolingbroke (David Hastings), Aumerle (Sean McGuire), King Richard (Greg Faber), Queen (Melissa Kearney), Mowbray (Lee Hamilton), Earl of Salisbury (Tom Wheeler) in Arden Shakespeare Gild’s RICHARD THE SECOND in Delaware until June 28. But kill’d itself much sooner. I’d not have show’d it. Leon. Do not draw the curtain. As we are mock’d with art. He’ll think anon it lives. The pleasure of that madness. Let’t alone. Leon. No, not these twenty years.